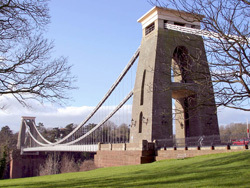 Learn English in Bristol, at the heart of the beautiful West Country! A vibrant, cosmopolitan city, Bristol is within easy reach of some of the United Kingdom’s top attractions. However, you may find you never wish to leave the confines of the city, what with all it has to offer. Follow fantastic shopping at elegant Cabot’s Circus with cocktails down on the harbour, or visit the historic SS Great Britain to learn all about Bristol’s fascinating maritime legacy. You can even get to grips with science at At-Bristol, the city’s exciting science museum. One of the city’s most iconic landmarks is the stunning Clifton Suspension Bridge, a structure that solidified the legacy of Isambard Kingdom Brunel, one of Britain’s finest engineers. Throughout the year you will find many events and celebrations taking place throughout Bristol. Two of the most popular are the Bristol Harbour Festival in July, where you can see some of Bristol’s best performers and artists, and Bristol International Balloon Fiesta in August, the highlight of which is the spectacular illumination of the balloons at night. Our English school in Bristol is located in the upmarket area of Clifton, perched on a hill overlooking the city, docks, and dramatic Avon Gorge below. Clifton is an historic part of Bristol, which is reflected in the number of beautiful Georgian buildings in this area. The school actually uses two buildings which are located less than 10 minutes’ walk from one another. There are 17 classrooms, 2 common rooms (with snooker tables, drinks machines, TVs and comfortable seating areas), 2 multi-media centres with free Internet access and free wireless Internet access throughout. The school does not have its own café, but there are plenty of cafes, bars and restaurants close by and, as the university has a campus nearby, these are generally good value. Our English courses in Bristol are suitable for all students with at least an ‘elementary’ level. On the first day, you should arrive by 09.00 so that you can take a level test. This will make sure that you are placed in the most suitable group for your level. You will then attend a welcome meeting and lunch, followed by an orientation tour and your lessons will actually start on the second day. Which course to choose really depends on your goals for your time in Bristol. If you need to improve your overall level, a ‘Super-Intensive’ group course would be sufficient. You will be tested regularly throughout your course to check your progress and you will also have regular meetings with your main teacher, just to check that you are enjoying the experience and progressing sufficiently. So that you get used to how different people speak English, you will usually have 2-3 teachers each day. If there is anything that you need to focus on specifically, you can add some private lessons to your course (usually offered as the ‘Intensive + Private Lessons’ course of 28 group and 6 private lessons per week). If you are hoping to take the Cambridge Exams, then you can give yourself the best chance of passing by taking one of our ‘Exam Preparation’ courses, which focus on the exam syllabus and the skills that will be examined. Take the stress out of arranging your trip by letting us organise your accommodation. You can stay with a host family, where you will have the most experience of speaking English on a daily basis with native speakers, or in self-catering accommodation with other students. All accommodation is located within walking distance of the school, which is very convenient and unusual for a city such as Bristol. Host families are very carefully selected and the majority have been working with the school for a very long time. Host families vary somewhat and may be a ‘typical’ family, or, more likely, an older couple or single lady (these tend to be the type of people who have the most time available to host students). Your hosts will provide you with your breakfast and evening meal. Shared apartment accommodation is best suited to students in their twenties, as although it is comfortable, it does tend to be quite basic. However, this option does allow a little more independence, as you will have access to a fully-equipped kitchen where you will be able to prepare your own meals. You will share this and the bathroom with your flatmates, although you will have your own bedroom. University residence is usually offered from the end of June until the end of September. This is also a self-catering option and, once again, you will usually have your own room and will share the kitchen, bathroom and general living facilities with the other residents. Activities are offered very regularly by our colleagues in Bristol, to make sure that you have lots of fun whilst you are learning English! Welcome drinks, afternoon teas, Friday film clubs, excursions to places such as Longleat House and Safari Park, lectures on local culture and live music evenings are just some examples of activities offered. Bristol Airport, just outside of the city, is the closest airport. You can also fly into Heathrow or Gatwick Airport. Most students take public transport on arrival, but airport transfers can be arranged for an additional fee.